Facebook officially rolls out its new discovery-focused Explore feed (the one with the rocket icon) on both desktop and mobile. More on TechCrunch. The Explore feed comprises posts only from Pages, and from what I see on my own tab, mostly Pages I’ve never liked! It’s all algorithmically controlled with the social graph to help you truly ‘discover’ new businesses and public figures. So, in the main News Feed, huge emphasis on posts by friends interspersed with ads. And on the Explore feed, posts by Pages you haven’t liked; no friends, no ads. Hm, we’ll see what Facebook is up to soon enough! Several senators are pushing for the Honest Ads Act to force giant online media companies such as Facebook and Google to disclose who is buying political ads. I will be a guest expert back on CheddarTV LIVE discussing this topic again on Friday, October 21st at 3:40pm ET. Facebook quietly rolled out the ability to share your screen using its native desktop Facebook Live feature. What does this mean? It could mean you can now teach classes sharing slides, or software demos, for example, directly on your Facebook Page (or your personal Timeline, in a Group or on an Event), completely free using Facebook. I tested the quality on two Facebook Live broadcasts yesterday – one with only my camera (turns out you can’t switch back and forth between camera and screen sharing), and one with just screen share including my ‘hack’ to have yourself on camera using an app like QuickTime Player per the thumb nail above! I must say, for now, I massively prefer the range of terriifc features offered by the great third party Facebook Live tools out there, such as eCamm Live for Macs, BeLive.tv, BlueJeans onSocial, Zoom and Wirecast! The right music can do wonders for your video. But, just like photographs, if you simply download and use a song you could be infringing on the creator’s copyright. Check out this epic resource from our friends at Buffer – 13 sources to find just the right tune! Of course, if you use video creation apps like Wave or Animoto, they include a great selection of royalty-free music, too! Most of us send and receive multiple emails in a day as an essential form of business communication. All the more reason to brush up on our email etiquette: punctuation, subject lines, signatures, to name a few. After all, that next email could land you a terrific contract or job, right?! To prepare for and create a great Facebook Live video broadcast, there are several things that are helpful to do before, during and after the broadcast. Such as communicating with fans before the event so they know when it’s happening, welcoming viewers during the video, and editing the video after you’ve finished all contribute to the success of your efforts. That’s a wrap for this week’s issue of The Social Scoop. I hope you have a fabulous weekend! P.S. Facebook training courses finally launching this month!! Facebook Live Success Secrets and FAST: Facebook Ads Strategy Training . More info here. Meantime, please enjoy my free four-part Facebook Live Marketing primer training series brought to you in partnership with BeLive.tv. 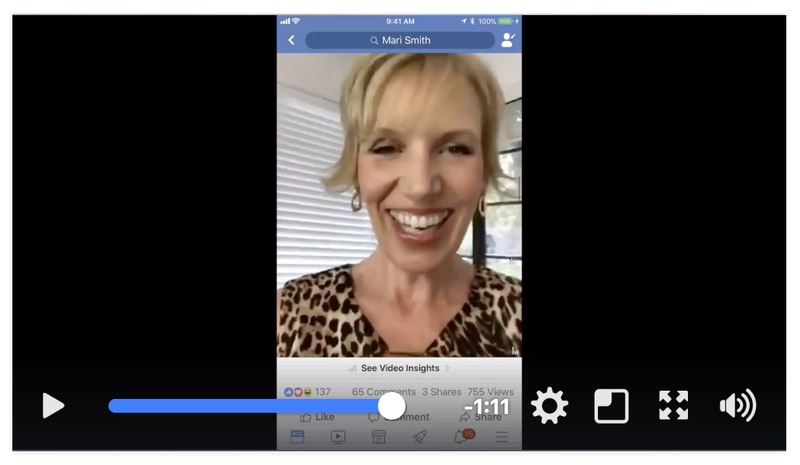 See the top video playlist on my page, “Facebook Video Marketing Training Series.” PLUS, stay tuned for my own video equipment list for in-home studio and mobile! Coming shortly!